Hey Philly, I’d like you meet my friend Montreal – you both make pretty awesome dishes why don’t we combine them into one massive Cheesesteak Poutine? Love, your mutual friend from Brooklyn. Cheese is a wonderful thing, it has so many textures, tastes, and types and can be prepared anyway your imagination takes you. Mixed in with my scrambled eggs, in a simple grilled cheese, a gooey mac and cheese, or tucked into my burger for a cheesy surprise – those are all a couple of my favorite ways. However, it’s probably no surprise around here that my most favorite cheese and cheese preparation is the one and only poutine. Squeaky, fresh cheese curds piled on top of gravy soaked fries – what’s not love? Plus I thought the cheese curds are the perfect homage to our friends at American Family Insurance who are based out of Madison, Wisconsin home to cheese curds! American Family Insurance and #SundaySupper are gathering for one final sit down around the Family Dinner Table and this time, if you couldn’t tell, it’s all about the cheese. It’s funny, despite my grand love for cheese, I was having trouble coming up with exactly what I wanted to make. So one afternoon while waiting for a movie to start, I started bouncing ideas off of Braden. First I was thinking of a poutine burger, I love putting french fries in my sandwiches and burgers. Then he one upped my suggestion to Cheesesteak Poutine, it’s the ultimate mashup of two very oh so bad, but oh so good for you foods. It’s a little something wild that can be prepared in one of two ways (side note, my pairing this with the beer little sumpin’ wild was total coincidence). 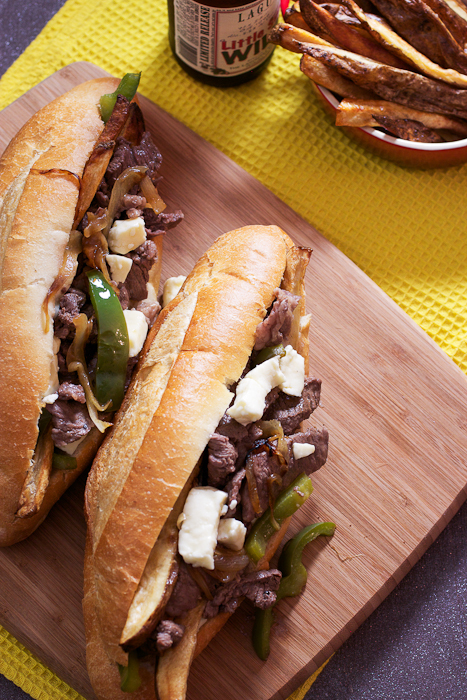 If you want to be completely indulgent, go ahead and breakout your hoagie rolls and fill them to capacity with sautéed onions, peppers, steak, french fries, cheese and topped with gravy. If you want to watch that carb intake and be just slightly less indulgent, skip the roll, toss all your fries in a bowl and add your toppings. Either way this combination is a win. Oh and I think for more winning cheese recipes you need to go check out AmFam’s Pinterest board! Place your potatoes on a large baking sheet and toss with 3 tablespoons of vegetable oil, season generously with kosher salt and roast for 40-45 minutes or until they are crisp and golden brown on both sides. Flip the fries about halfway through. Place your partially frozen rib-eye on your cutting board and with a sharp knife, slice into 1/4 inch slices. Set aside to fully defrost and then season generously with kosher salt and pepper. In a large cast-iron skillet over medium heat, drizzle about 1 tablespoon of olive oil and sauté the onions and peppers until soft and lightly caramelized, stirring occasionally. About 30-35 minutes. Remove from pan and wipe clean with a paper towel. Turn the heat back to medium, add a small about of olive oil (about a teaspoon or so) and cook the steak until no longer pink through, about 10 minutes. While the steak is cooking, in a small saucepan over medium-high heat bring the beef stock to a boil. In a small bowl, mix the cornstarch with a tablespoon of water to create a slurry. Whisk the slurry into the stock and bring back to a boil. Whisk in the butter and season generously with black pepper. Continue to cook the gravy for another 2-3 minutes until thickened. If using the hoagie rolls, slice down the center but leaving the ends in tack, fill with the onions and peppers mixture, then a few french fries, top with some steak, cheese curds and finally some gravy. 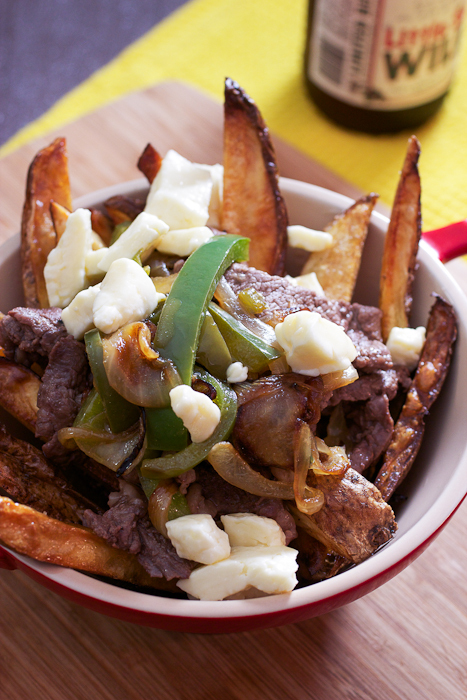 If you are opting to not use the rolls, place a good amount of fries in a bowl, top with onions, peppers, steak, cheese curds and gravy. When slicing your rib eye, it's best to make sure it's partially frozen. It's easier to slice and will help achieve thinner slices. For more information on American Family Insurance you can visit them onLinkedin, Youtube, Google +, Twitter, Facebook and Pinterest! Don’t forget to check out all the amazing recipes we have lined up for you this week! This post is sponsored by American Family Insurance. All opinions are my own. 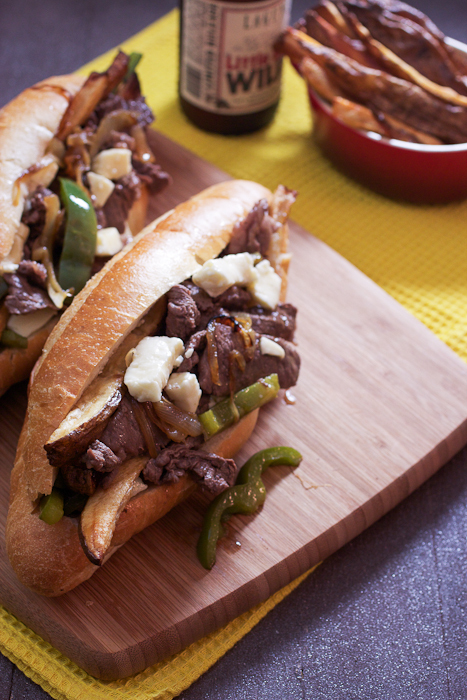 Seriously tasty cheesesteak sandwich! All that goodness piled in there. Yum! Great tip about slicing the meat partially frozen. 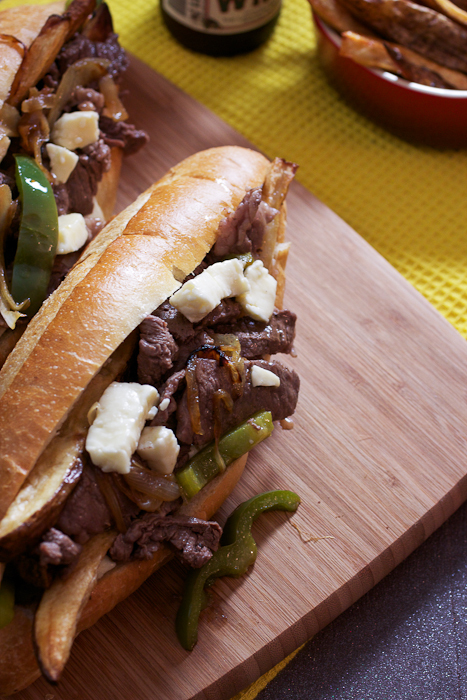 Maybe one of these days I will actually listen to it when making cheesesteaks… Those fries look sooo good. Oh my goodness… we are from Philly and love a good cheesesteak AND I just tried poutine for the first time during my visit with American Family. I can only imagine the flavor of the two mixed today. Well done! Never had poutine, and now I WANT IT! This looks RIDICULOUS! I need it in front of me right this moment. Please? This reminds me of our local “Grease Trucks” and their fat sandwiches that have chicken fingers, mozzarella sticks and fries, or cheeseburgers and fries or other combos like that on a sub roll. This definitely takes it up to another level though! Oh, my. What an irresistible sandwich…go much deliciousness going on with each bite. And my bites would be BIG bites! Hoagie roll…or breadbowl? lol This is such a fun dish! My boys (and husband) would be all over this one. I may have to make it for them… ok me too, for our football tailgates. Yum!! YESSS. This needed to happen. And only you could have done it right! LOVE! Wow, my husbands family is straight from Canada, this would be big hit in my house, thanks for sharing!! Typical Susan with her poutine 😉 Pittsburgh has a big traditional with fries on sandwiches, so this cheesesteak poutine will fit right in! Oh, my goodness, Susan. 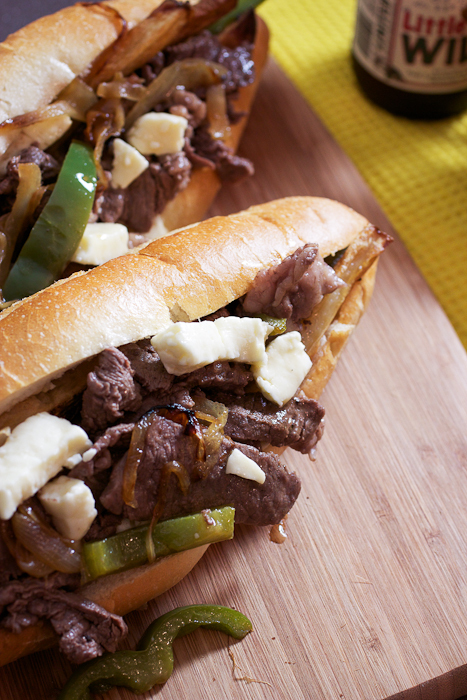 Your marriage of Philly and Montreal specialties is beyond! Philly Cheese Steaks are one of my husband’s favorites..And I’ve seen a few beauties during our marriage. But, yours with the divine potatoes takes the cake! Oh my goodness! This sounds like heaven, and I want a big bowl right now! Girl, you are just so creative! This recipe is such a winner on so many levels. And it REALLY makes me want to go back to Montreal. I just loved that city. I think if you got a food truck and only sold this, you’d still do bank! Mango Mint Spritzer + A New Look!